Last year’s Moto E4 Plus stunned us with its fantastic battery life, and the new Moto E5 Plus is on track to do the same. It retains the 5,000mAh battery to keep you chugging along for more than two days, and while the new phone is largely a specification bump, Motorola has fixed one of our biggest qualms — the Moto E5 Plus doesn’t look like a cheap phone anymore. There’s also the Moto E5 Play, which is even more affordable. We’ll take a quick look at what they have to offer, and you can also read our Moto G6 and Moto G6 Play hands-on review to learn more about the rest of Motorola’s budget 2018 lineup. Like the new Moto G6 and G6 Play, the Moto E5 Plus borrows heavily from the Moto X4, which debuted in late 2017. The edges on the back curve inwards, allowing for a comfortable grasp around the phone, and a circular camera fixture sits at top-center. Below it is the iconic Motorola dimple, which doubles as a fingerprint sensor. 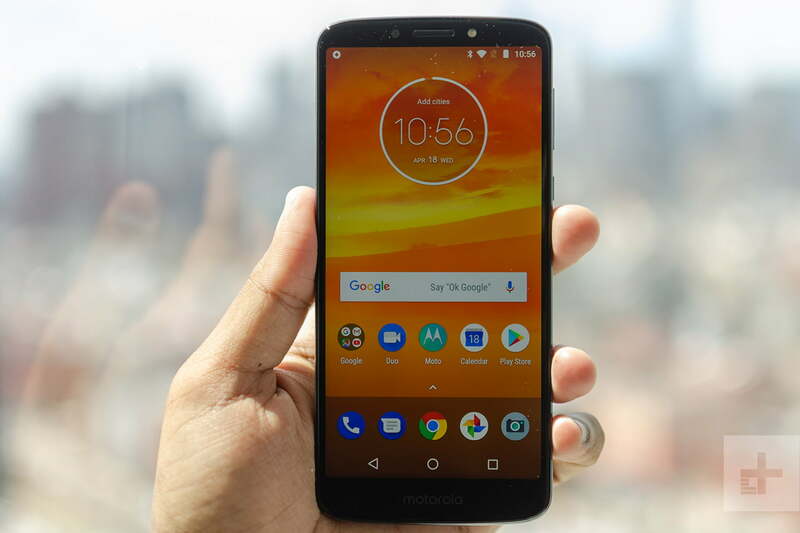 The Moto E5 Plus is the heaviest of Motorola’s budget lineup, at approximately 7 ounces (200 grams). 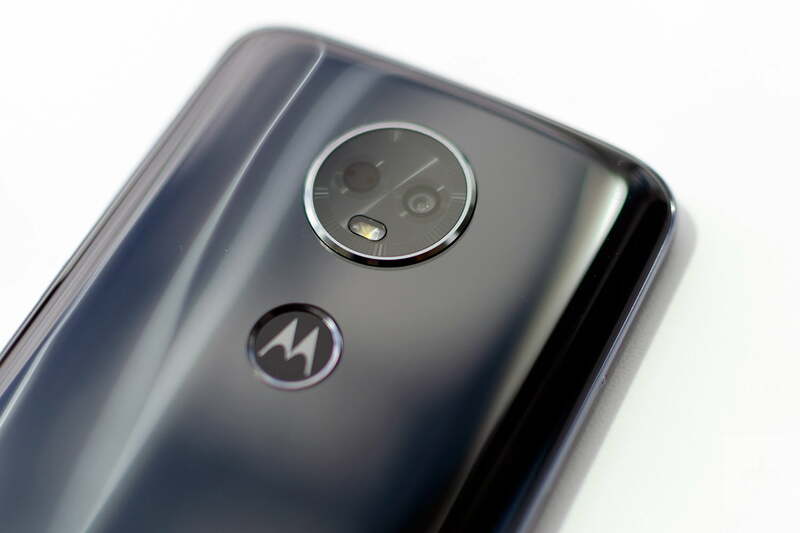 While Motorola made it look more high-end, it still feels cheap due to the use of polymer glass on the back (it’s not as durable or scratch-resistant as the Gorilla Glass 3 on the Moto G6). The Moto E5 Play, on the other hand, is the lightest. It has a plastic (Motorola calls it micro texture resin) removable back, which means there’s a removable battery as well. The E5 Play, like the E5 Plus, has a camera fixture in the top-center, with an indented fingerprint sensor below. It curves at the edges of the back, and that makes it comfortable to hold. The fact that it has a smaller 5.2-inch screen helps as well; the E5 Plus has a 6-inch screen, but we didn’t think it felt unwieldy. The E5 Play’s plastic back will attract scratches easily, as we already noticed a few scuff marks. 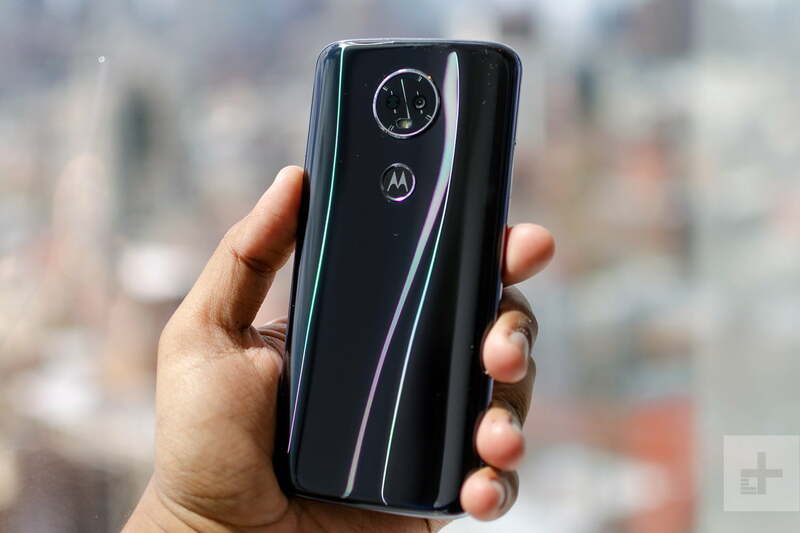 On the front, Motorola made some effort to shave down the bezels surrounding the screen — jumping on the “bezel-less” trend in smartphones. There are still some sizable bezels, but we’re happy it’s a little slimmed down. Only the Moto G5 Plus utilizes an 18:9 aspect ratio, which means you’ll be able to see a little more content in vertical-scrolling apps than with previous Moto E devices. There’s a Motorola icon on the back of the phone, but the company’s name is also printed on the front of both Moto E phones. 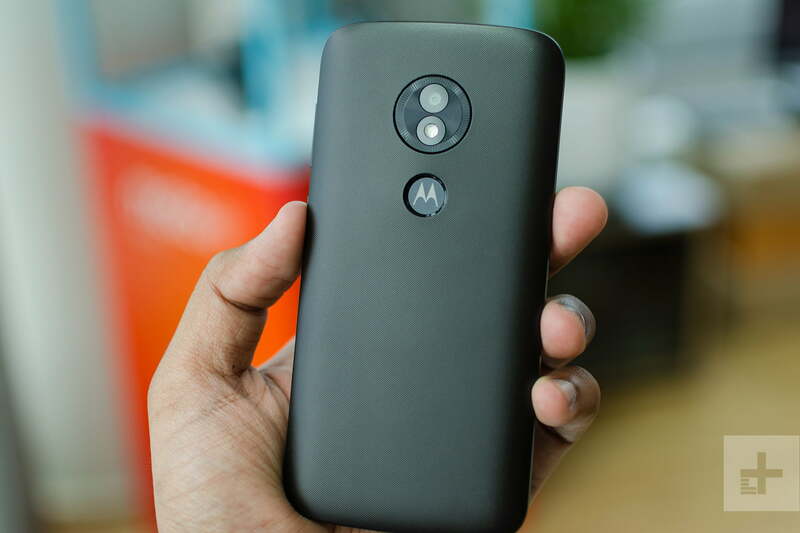 We wish Motorola could be a little more subtle, as it just makes the front look busy. A volume rocker sits on the right edge, with a power button below it; at the top is the headphone jack, and there’s a MicroUSB charging port on the bottom. For super-affordable phones, the Moto E5 Plus and Moto E5 Play look great. The 6-inch IPS LCD screen on the Moto E5 Plus has a 1,440 x 720 pixel resolution. The screen may not be as sharp as higher-end phones, but it manages to look good. It doesn’t get bright enough to see outside in daylight, but we’ll have to do more testing to confirm. The 5.2-inch E5 Play has a 1280 x 720 pixel resolution, and the screen doesn’t look fuzzy at all thanks to its smaller screen size. For super affordable phones, the Moto E5 Plus and Moto E5 Play look great. Again, they still feel cheap, but they’re ergonomic. The polymer glass on the E5 Plus does seem like a recipe for a shattered front and back, so make sure you grab a case. There’s also no IP-rated water-resistance, but both phones are splash-resistant. The Moto E5 Plus is powered by Qualcomm’s Snapdragon 435 processor, with 3GB of RAM and 32GB of internal storage. The Moto E5 Play uses either the Snapdragon 425 or the Snapdragon 427 — it’s dependent on the carrier you’re buying it from — as well as 2GB of RAM and 16GB of storage. Both have MicroSD card slots for more space. We didn’t run into any problems moving throughout the phone’s Android 8.0 Oreo operating system, but we only used it very briefly during the phones’ launch event. Opening apps is a little slower than flagships, and we’ll have to do more testing to see how this phone performs with more intensive tasks. This is not a phone for power users, as it won’t be able to satisfy all your needs. We’re happy to see near stock Android again on these phones; Motorola phones don’t have a lot of pre-installed apps or services. But there is reason for disappointment. A Motorola spokesperson told Digital Trends both these phones will not receive any Android version upgrades. That means when the new version of Android comes out around August, the Moto E5 Plus and Play will not receive it. The reason? 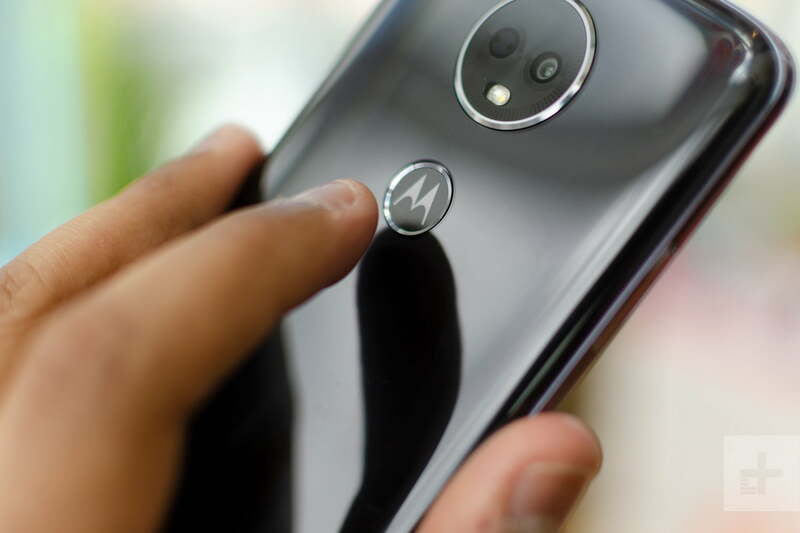 Motorola said its customers sometimes aren’t fans of software upgrades, but it’s largely because both these devices are carrier phones, and Motorola doesn’t expect the carrier to issue an update. It’s appalling that a phone manufacturer can release a phone and say it won’t upgrade the software for it at all. When the new version of Android comes out around August, the Moto E5 Plus and Play will not receive it. On the bright side, Motorola said it will issue security updates every 30 to 60 days, for two years. Both these phones should last you a good deal of time, especially the Moto E5 Plus. It has a 5,000mAh battery, which means the Plus will likely last more than two days. 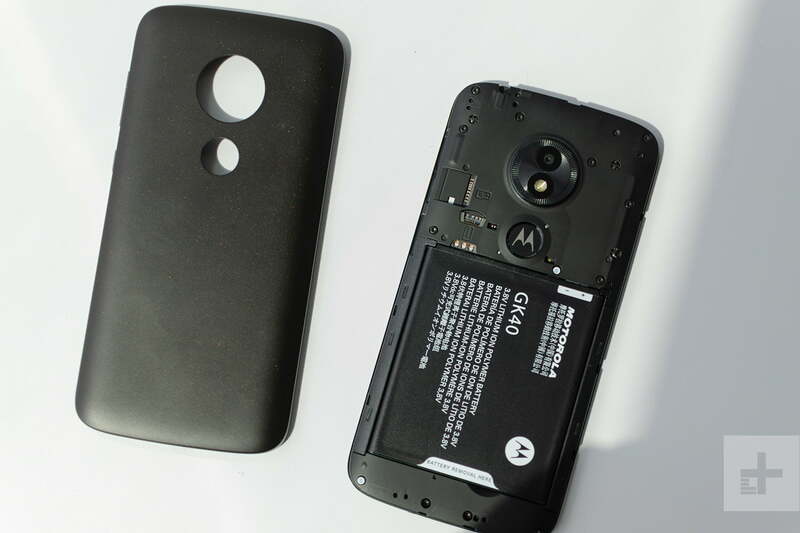 It supports Motorola’s TurboPower fast-charging technology as well. The E5 Plus only has a 2,800mAh battery, but considering the low-power specs on the phone, that capacity should definitely make the phone last quite some time as well. There’s no NFC here, so you won’t be able to use Google Pay to make contactless payments. In our brief tests, the camera on both these phones are certainly capable, particularly in good lighting. The E5 Plus has a 12-megapixel rear camera with a f/2.0 aperture, along with an 8-megapixel front-facing camera with a f/2.2 aperture. The E5 Play has an 8-megapixel rear camera with a f/2.0 aperture, and a 5-megapixel front-facing camera. Both phones have flashes on the front for selfies. We noticed a little shutter lag when tapping on the shutter icon, which produced some blur in photos. If you hold still, you can take some solid photos with good color and detail. But don’t expect much in poorer lighting conditions. We’re not sure how much both phones will cost, but last year’s Moto E4 Plus and Moto E4 were priced at $180 and $130, respectively. It’s likely the new versions will stay around this price range, but it’s entirely dependent on the carrier. These are carrier-only phones, so you won’t be able to buy them unlocked. Motorola said we can expect to see them launch in the U.S. this spring. For those estimated low prices, the Moto E5 Play and Moto E5 Plus are excellent value. We hope Motorola strongly rethinks its software upgrade plan to give these two devices Android P when it rolls out.